Descubra la vida silvestre y los arrecifes de coral de Ambergris Caye en una excursión de 3.5 horas en barco y snorkel a la Reserva Marina Hol Chan y al callejón de rayos de tiburón. Nade sobre las brillantes formaciones de coral en Hol Chan y observe las tortugas marinas, anguilas y peces que crecen dentro del área protegida. Sumérjase en el agua con las rayas y los tiburones nodriza en el callejón de tiburones, mire cómo se alimentan de sardinas frescas, luego disfrute de la brisa tropical y un cómodo asiento en la cubierta cuando regrese a San Pedro. The guides were well versed and knew the ocean well. They were fun, personable and I felt extremely safe the entire time. Really great tour! Perfect length of time. The guides Daniel and Carlos were awesome. They were very friendly, knowledgeable, and made the trip a blast. 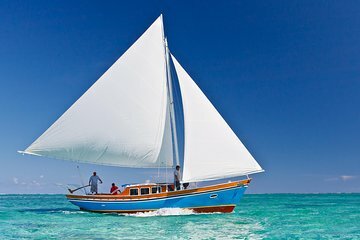 Sailing is definitely the way to travel. Being on the sailboat made the trip even more enjoyable. This tour was amazing! It was so much fun to relax on a sail boat with a small group. Our tour guides were wonderful. Daniel was full of knowledge about the island and preserving the reef and it's sea life. He gave us a guided snorkel tour so that we could learn about the fish we saw. Jumping in with the nurse sharks was a highlight of our trip. I can't recommend enough! Fantastic trip! Boat ride out to the snorkeling site was awesome. Beautiful day and very accommodating crew. Once we got to the site the dives were great. We even had one in our party who isn't a good swimmer and is generally afraid of marine life. One member from the crew stayed with her the whole time and made sure that she had an enjoyable experience in the water. Highly recommend and would do it again. Best time ever! Loved swimming with all of the animals. Staff was knowledgeable, punctual and thorough. Absolutely jaw dropping gorgeous. Sailing to the Hol Chan Marine Reserve and snorkeling it was beautiful, while seeing such a variety of corals and fish. Shark Ray Alley consisted of harmless nurse sharks and rays that you snorkel with. Our tour guide was great and gave us fresh pineapple. Amazing! We swam with sharks and stingrays and you are actually able to touch and feed the stingrays and fish. Hol Chan was beautiful. We saw the coral reef, eels, and lots of fish...it's another world down there and it's excited to watch it! Wear lots of sunscreen. The sail ride was beautiful!